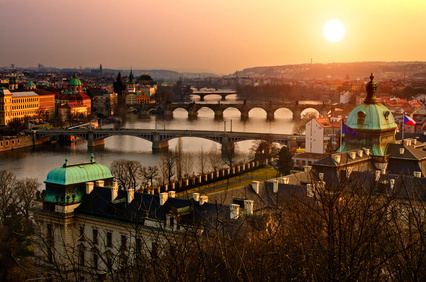 Monarch Air Group provides private air charter in Prague, Czech Republic. Our clients benefit from top-notch service, unrelenting dedication to safety, wide selection of aircraft, and years of experience in chartering private jets. To obtain a free quote, please use our online quoting tool provided below, or call toll free 1-877-281-3051. Monarch Air Group provides private jet charter flights in and out of Prague, Czech Republic. Prague is the capital and largest city of the Czech Republic. It is a popular tourist destination renowned for its imposing castle, wonderful galleries and museums, jazz clubs, fashion influence, and concerts. The Czech Republic encompasses the ancient lands of Moravia and Bohemia, and possesses a rich culture represented by the likes of writer Franz Kafka and classical composer Antonin Dvorak. Popular places of interest include the Renaissance architecture of Vysehrad castle and the postcard picturesque chateaux and landscaped gardens of Lednice-Valtice,Old Town’s astronomical clock, the Estates Theater, where Mozart conducted Don Giovanni and the Museum of Communism.